My first problem with this book was its title. From the title alone, I assumed it would be about the spread of Australian cinema into other cultures (probably a study of film reception or distribution), or of the role and influence of Australians in other film industries across the globe (probably a study of expatriate actors and directors and producers). It is neither of these. Toby Miller’s introductory “provocation” very quickly shifts the debate from the one-way flow of “diaspora” to the multi-directional flow of migration and (for Australia) the consequent social policy of “multiculturalism”. For this book is primarily about the representation of non-Anglos in films made within Australia. Part 1, Theories, consists of five chapters broadly concerned with ways in which such representation has been conceptualized. In the first of these chapters, the editors position their definition of “diaspora” within recent theoretical debates. For them the term means movement in any direction and from any direction, resulting in what they call “diasporic hybridity”. This is a useful term, but it seems a pity that the specificity of the original definition of “diaspora” is lost. In practice, in this book “diasporic” is often used as a synonym for ‘cultural’, though the meaning also shifts from one usage to another and (even more significantly) from one writer to another. 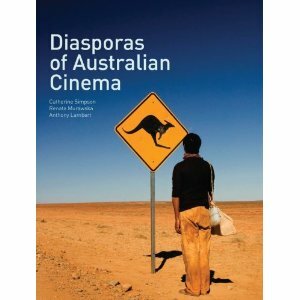 In chapter 2 Catherine Simpson proposes a taxonomy of “diasporic Australian film”, in six categories. The film which is the primary subject of her piece is Lucky Miles (James Michael Rowland 2007), which she describes as a film of “difference, distance and dud maps”, and positions within the categories of “wog comedies” and “the tourist”. Audrey Yue and Sonia Tascon both employ idiosyncratic definitions of “ethics”, the former in relation to the internationally acclaimed short film The Last Chip (Heng Tang 2005), the latter in investigating the link between romance and multiculturalism in the documentary films Molly and Mubarak (Tom Zubrycki 2003) and Amanda and Ali (Karen Hodgkins 2003). Anthony Lambert discusses how two Australian films many years apart (Journey among Women, Tom Cowan 1977 and Over the Hill, George Miller 1992) position white women as temporary aboriginals by requiring them to mimic aboriginality. The second section of the book directly addresses representations of ethnicity: “Wogboy comedies and the Australian national type”, excess in the representation of “crazy Russians”, the Anzac counterposed against the Hun and Turk, and the representation of Japanese and Greeks. It seems a pity that the categories and approaches proposed in the first section do not seem to have any relation to the way the various writers in this section approach their subject texts. In the final section each chapter provides a discussion of the work of an individual film-maker: first generation immigrants such as Paul Cox, Sophia Turkiewicz and Sejong Park, as well as Tom Zubrykci, who has demonstrated a continuing interest in im/migrant issues. Each chapter does provide some biographical story to inform the discussion of the films, but that is all that these chapters have in common. The “diasporic filmography” captures all the approaches of the various sections and contributors. It lists titles and a short description of why they qualify, which might be on the grounds of subject matter (The Odd Angry Shot: “Australians in Vietnam during the war”) or on the grounds of the country of origin of the director (The Quiet Room: “writer-director from the Netherlands”). My problems with this book are not usually with the arguments presented by individual authors. Among the chapters are effective restatements of familiar arguments about representation, as well as some clear-sighted and original readings of less-frequently-discussed films or genres. However, I have major reservations about the application of the term “diaspora” in this context. Some writers are very careful in their use of the term: Susie Khamis explains the challenges inherent within it, and Ben Goldsmith and Brian Yecies carefully distinguish between “diasporic” and (their preferred) “transnational”. Other writers are far less comfortable with the term, either appearing to avoid it or scattering it around willy-nilly. In fact there seems to be a correlation between overuse of “diaspora” or “disaporic” and expression so convoluted and obfusctory that a reader struggles to find the meaning wrapped up somewhere within. Admittedly, it is not always the definition of “diaspora” that brings some of the writers unstuck: in some cases, more rigorous editing might have made the task of a reader easier. Still, it is worth persevering with the book as a whole. At the very least it opens up for debate some less-frequently-asked questions about that hoary old question of what constitutes a “national” cinema, and particularly what might constitute an “Australian” cinema.